I have been in a “cleaning out” mode lately….not really sure why. It could be that I am “nesting” for my daughter in law who is expecting any day now….or that I have been gone all summer and I feel that need to re-establish some semblance of order to my closets…or that I have watched too many episodes of Hoarders and I fear that I will become “that person”. Whatever the reason…it really doesn’t matter….as I pulled out boxes from under bed…I came upon it. My box of purple heart moments in raising children. It took me a minute to realize what was in the box….the collection of scrap papers…some little…some thick…some with “for eyes only”…as if it was a threat to national security….all addressed to…mom. After reading the opening lines of the first one…it all came rushing back to me…the pain and struggle of raising a child in a “yes” world….when my answer was for the most part…no. I felt battle worn as my kids grew up…constantly trying to stay one step ahead…realizing that I was losing some battles along the way…but I was intent on “winning the war.” I was told by many seasoned veterans to “pick my hill to die on”….so I was selective in what I would “let slide”…and what I would stand firm on. It did not make me a “popular member” of the household…but I knew I had to be the parent…I had to do what I knew was right…even if they could not see it at the moment. Anyone who knows me, knows I am a softie….as in I hate confrontation…and I hated to be the enforcer…but when I “signed on” to be a parent…discipline came along with it. The notes in the box were the “I’m sorry” notes. The ones I would find tucked into my medicine cabinet….in my purse…on my dresser…where they knew I would find it. The “I am sorry I made you cry”….”I am sorry I did not listen to you”….”I will try harder I promise”…always made me cry..wondering if I would make it through this. Parenthood is not for wimps….or the weak…because it is trial by fire…that is especially brutal during those teen age years. Over the years it has come to light that God is my Father….in every sense of the Word…and I have been…sadly, still am from time to time….the rebellious youth. I find myself railing against “His rules”…what the Word has told me I should do…and sit in the same spot as my children…”sending” my note of apology…for “His eyes only”…to set right what I did wrong. Paul could not have put it any better. God gives us free will to chose what we will do….gives us enough rope…but that does not mean we will always make the best of choices. It seems that when we make our own decisions…with the “child like ME” mentality…that it does no good for anyone. God wants US to make the right choice…but like my own children…that is not something that I do. 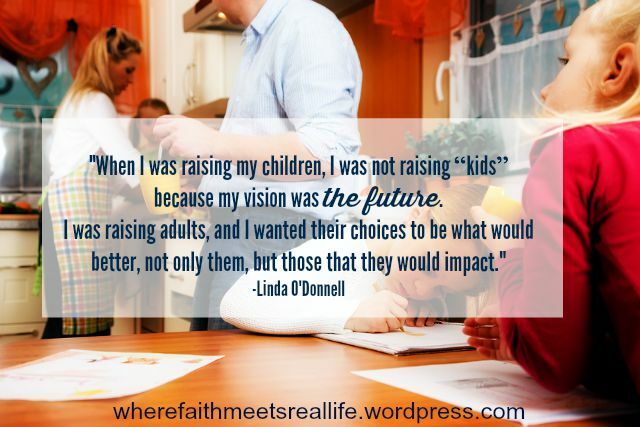 When I was raising my children, I was not raising “kids”…my vision was the future…I was raising adults…and I wanted their choices to be what would better not only them…but those that they would impact. Just as God works on me…wanting me to have “His impact” on those that I “do life” with. I made the decision to get rid of that box. It does not define my kids…it was a reflection of what we went through…together…and made them who they are today. Both are responsible…kind…compassionate…caring…and truly exhibit who God created them to be. I sit in awe of my kids…their character…their very nature that speaks of God to all they encounter. I did not need the reminder of the struggle it was for a parent to raise children in a world that says “yes” way too much…and defies you to stand firm in your “no”. ← Stories Are Awesome. God Stories Are The Awesome-est.